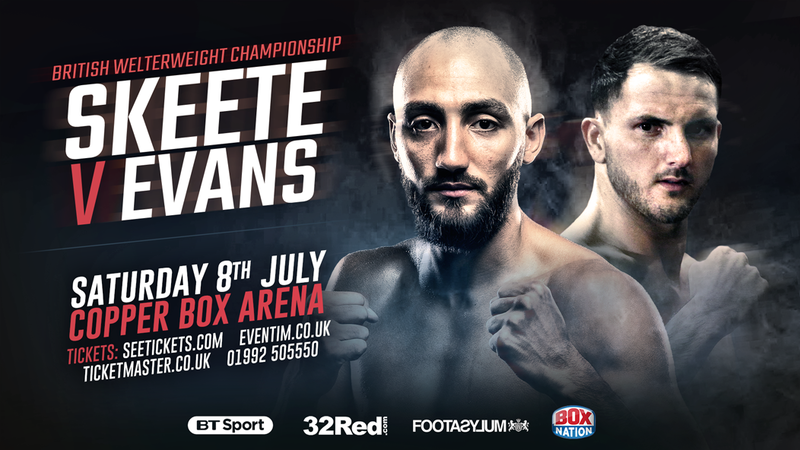 Bradley Skeete will have the chance to win his British Welterweight strap outright when he takes on Welshman Dale Evans at the Copper Box Arena on Saturday 8th July, live on BT Sport and BoxNation. Penge star Skeete outboxed and outclassed Birmingham’s Sam Eggington to claim the prestigious Lord Lonsdale Belt back in March 2016 before making successful defences against John Thaine and most recently Shayne Singleton. Victory for Skeete will not only secure his dream belt, but also move him closer to a shot at World honours with his high ranking in both the WBO and IBF. “It has always been my dream to win the British belt outright,” said Skeete. “I have worked incredibly hard to get into this position and I want to get beautiful belt for keeps. I want to move up in levels and I’ll be able to do that after this win; I’m a stubborn man! “My hands are fine, I’ve got no cuts and no bruises and I’m ready to go. I proved I was levels above Shayne Singleton and I’ll do the same against Dale Evans. He is a strong opponent and will give his all to take the belt from me but I’ll have an answer for everything he throws at me. Evans, 25, says he wants to win the British title as a tribute to the late Mike Towell. The Scotsman passed away after being injured in a final Eliminator for the British title with Evans in Glasgow in October last year. “Nothing would make me happier than winning the British title and taking it up to Dundee and showing Mike’s family and his friends,” said Evans. “Winning it would make me so proud, and I think it would make my family proud and Mike too. Another exciting addition to the card sees gifted Leicester Super-Featherweight Lyon Woodstock look to move to 10-0. Woodstock forced an impressive third round TKO over Birmingham’s Paul Holt to pick up the Vacant Midlands Area strap in April and is quickly making a name for himself as a rising star in the division. News on teenage Heavyweight sensation Daniel Dubois’ next opponent will be announced early next week. 19-year-old ‘DDD’ has ripped through his first three opponents and is already becoming an avoided man in the division. Elsewhere on the card Gary Corcoran faces Larry Ekundayo in an intriguing battle for the Vacant WBO Intercontinental Welterweight strap; Darryll Williams and Jahmaine Smyle rematch for the English Super-Middleweight belt after their Fight of the Year contender in April; Sam McNess gets his first pro title shot against Southern Area Super-Welterweight Champion Asinia Byfield and teenage Heavyweight sensation Daniel Dubois looks to move to 4-0. A talent-packed undercard also features rising Welling Super-Featherweight Archie Sharp; red-hot Southampton Featherweight Ryan Garner; explosive Manchester Cruiserweight Jordan Thompson and Sikh sensation Sanjeev Sahota; plus the professional debuts of Kent Middleweight Sean Phillips and Iver Middleweight J.D Smith.